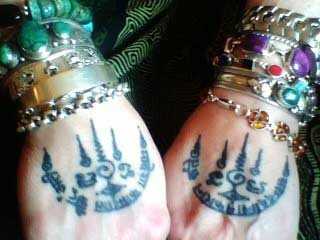 Two years ago after living a life dedicated to the path of Self-Realization I was led to get a series of tattoos in Sanskrit and Yantras of prayers and Gods/Deities names for the purpose of protection and spiritual development. Over the course of two years I received nine tattoos. After receiving each tattoo I felt more myself. I was also led to dye my hair a dark color. After this transformation physically, mentally, emotionally and spiritually I took the title of Swami permanently which is a life commitment to the path of Self-Realization and Contemplation. I live in the west and get both positive and negative attention, even when others know that they are for spiritual commitment and transformation. My name is Swami Ramaraaja. I am woman holy person, an author and spiritual teacher. I reside in the United States.